Last week I visited Tham Lod caves near Pai. This is a 1.6km long network of caves situated about 1.5hrs north of Pai in Northern Thailand. If you’re interested in a cave full of bats and weird shaped rocks then you’ve hit the jackpot. As with all roads near Pai, the road is very windy and quite steep at some points. Having only learnt to ride a scooter the previous day, I didn’t quite feel ready for that adventure so I joined a half day tour from Pai Expert Travel, a tour company located in Pai. But if you’re an experienced rider, you can easily rent a scooter in Pai for around 100baht and make your own way there. There are also a number of full day tours that visit the caves along with other attractions in the surrounding areas. After a few pick ups around Pai, we were on our way by around 3pm. On the way to the caves, we stopped off at Doi Kiew Lom view point, this was about half way so makes a good place for a snack and toilet break. On a clear day you’ll get a great view across the Thai landscapes, unfortunately we visited during burning season so the view was not too impressive. On arriving at the caves our tour guides met us with their gas lanterns. It is essential to visit the caves with a guide. You will need one guide and one raft per 3 people due to the size of the bamboo rafts. The cost of a guide and raft was 450baht per group so it is best if travelling in groups of 3 to spread the cost. The caves are an eco tourism project and all proceeds from guide and bamboo raft services go to local these villagers who have helped build the ladders, steps and bridges that make the caves safely accessible. It took the guides a few minutes to get their lanterns burning before we headed inside. I got a really exciting feeling as we went further in to the caves with nothing more than our guides and a gas lamp. There are three chambers within the cave, we visited all 3 but I believe some of them are closed in certain periods of the year so you may wish to check ahead. The first chamber we visited was by far the most spacious with a huge column down the middle over 21 meters high. The temperature was super cool which was a perfect break from the humid climate outside. It is a bit of a maze through the system of caves and ended up being quite a workout, be prepared for lots of steps. The cave is full of stalagmites (pictured below) where dissolved calcite water drops from above but the water evaporates leaving calcium carbonate formations. The second chamber (also known as ‘The Doll Cave’) is known for having many rock formations that resemble recognisable objects. As we proceeded around out guide would point out shapes like a crocodile, Budda, a doll (hence the name), an elephant and many more. I must admit some of these did feel like a bit of a stretch of the imagination. You’ll also see remains from a prehistoric cave painting drawn about 2-3000 years ago by a native hunter. It’s difficult to see as it has been eroded over time but is thought to be a deer and arrow. The main feature of the caves was the river that runs through the centre. The highlight of the trip was taking the bamboo raft down this river to reach the third caves. The rafts were surprisingly sturdy, each holding 3 tourists, the guide and the rower. 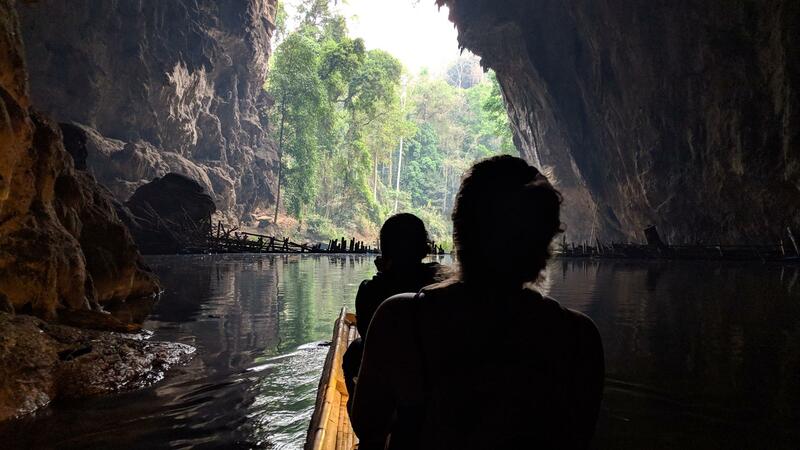 It felt magical to drift through the cave with nothing more than the sound of the oar splashing the water every few moments and the occasional eerie noise from the bats. As I looked down in to the water I could see many huge fish aimlessly swimming about the water. Our guide sat at the front with the gas lantern providing some lighting in the dark parts. As we neared the end of the raft hourney, the cave was flooded with natural light from the end of the tunnel. Our rafts waited whilst the guide showed us the third chamber. The third chamber is known as the coffin chamber because of the teakwood coffins and ancient human corpses found in the cave. Our guide pointed out the remains of one of these coffins. If you visit in the evening, you may be able to see the bird show, this happens a little after sunset where more than 300,000 swift birds fly in to the cave at the exit. Unfortunately, we didn’t see this as the language barrier confused the time that this would happen. We spoke to some other tourists who saw it just before 7pm and said it was an incredible sight of nature. The language barrier was the biggest downside to the whole tour. The guide didn’t speak much English and with no audio guide either it was a little lacking on information. I’d recommend learning a little about the caves before you visit so that you can make the most of your trip. We boarded the raft for our return journey back towards the entrance where our guide showed us back to the tour bus, we were able to grab some Pad Thai from a stall near reception before heading back to Pai.